Eyes Front! No looking back. The last thing anyone in Ottawa wants is another post-mortem on the 2007-08 season. Determined to improve on their performance in the previous Stanley Cup Final, the Senators shot out to a 10-1-0 start, leveled out as one of the NHL's better teams at midseason and then collapsed, barely qualifying for the playoffs. Sure, a running battle developed between coach John Paddock and goalie Ray Emery that would cost both their jobs. But the disappointments weren't limited to those two. The funny thing is that a look at the year-end results showed most Ottawa players close to their recent point averages. The cause of the collapse was the decline of team chemistry and coordinated team play. It seemed like the heart went out of the players during the battle between coach and goalie that drew in others. 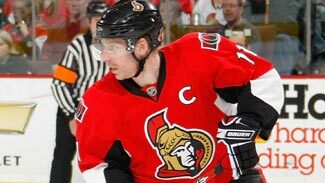 The Senators had three players in the top 15 in scoring, Jason Spezza (4), Daniel Alfredsson (9) and Dany Heatley (15). Anton Volchenkov was second in the NHL with 209 blocked shots. Chris Phillips was 13th with 151 blocks. The team led the NHL with 3.15 goals per game and was seventh by winning 51.7 percent of its faceoffs. They were seventh-best in 5-on-5 play and 12th on the power play. But they were also 24th in allowing 2.95 goals per game and 22nd in killing only 81 percent of their penalties. This was a team that was 27-10-4 after 41 games and then went 16-21-4 over the last 41 games, 3-6-1 in their final 10 games. The Senators were 22nd in the NHL when trailing after the first period and 19th when leading after two. They allowed 247 goals, seventh-worst in the NHL. That was 26 more goals against than the previous season, 36 more than 2005-06 and 58 more than 2003-04. No-nonsense coach Craig Hartsburg has been brought in to restore discipline, on and off the ice. He has also said he'll try to spread scoring around the lineup, which probably means breaking up the first line of Spezza, Heatley and Alfredsson. Veteran defenseman Wade Redden left via free agency. Fellow defenseman Andrej Meszaros was traded to Tampa Bay for Filip defensemen Filip Kuba, Alexandre Picard and a draft pick. Randy Robitaille, Cory Stillman, Brian McGrattan, Marty Lapointe, Mike Commodore and Luke Richardson are gone. Additions Jason Smith, Jesse Winchester, Alex Auld and Jarrko Ruutu are viewed as team-character enhancers. Martin Gerber's season reflected that of the team and continued his history of being named a No. 1 goaltender and then losing the job. Gerber started 12-1, but had only three wins in his last 10 starts. Emery was being used for intermittent relief until Gerber won only one game in seven appearances between Nov. 17-Dec. 12. Meanwhile, Emery had no wins in six games between Nov. 8-Dec. 4. Gerber then got back on track with six wins in seven games through Dec. 27. There was a three-game win streak in March over Phoenix, Montreal and Boston, but that was followed by the weak final 10 games. At least he was in the lineup. Ottawa didn't use Emery after March 24. Gerber went 17-23-7 in two seasons as Jean-Sebastien Giguere's backup in Anaheim and was acquired to be the No. 1 starter in Carolina, but lost that job the next season to Cam Ward. Ottawa gave him a three-year deal in July 2006 and he lost the starting job to Emery. So, Gerber has been the backup goalie on a Stanley Cup winner (Carolina) and two losing finalists (Anaheim and Ottawa). He went 30-18-4 last year and the No. 1 job is his again. Ottawa signed veteran Alex Auld this summer to be the backup. Auld's star has faded since he went 33-26-6 in 67 games as Vancouver's starter in 2005-06. The Canucks traded him to Florida in a five-player deal to get goalie Roberto Luongo. Auld lost the Florida job to Ed Belfour and split last year as the backup goalie in Phoenix, then Boston. Ottawa may be a year away from turning the job over to one or both of their two 23-year-old goalies in Binghamton. Brian Elliott wrestled the starting job there last year from Jeff Glass and is seen as a rising star. He led the University of Wisconsin to the 2006 NCAA championship and went 18-16-4 in the AHL last year, despite a nice .915 save percentage. Glass is no slouch. He was the Canadian Major Junior Goaltender of the Year with Kootenay in 2005. He spent a year with the Charlotte Checkers in the ECHL and is 24-39-11 in two seasons at Binghamton. He was 15-15-9 last year and had a .913 save percentage. They won't seem like the Senators without Wade Redden eating up minutes and jump-starting the offense as he did for 11 seasons. Mike Commodore is also gone from the top-six defensemen of a year ago. The quiet Chris Phillips is the senior member of the defense. He topped the Senators with 22:28 minutes of average ice time. Phillips had five goals and 13 assists and was plus-15. Filip Kuba and Alexandre Picard should fit in nicely, with Kuba bringing a veteran presence and Picard plenty of promise for the future. Anton Volchenkov was the leader with 209 blocked shots while Phillips was next with 151. Christoph Schubert led with 187 hits. Volchenkov had 153 and Phillips had 126. Every returning defenseman was in the plus category last season. So how did Ottawa finish 24th with an average 2.95 goals-against per game? For one thing, there was no reason not to crash the net or to set up in front of Ottawa's goalie. Commodore had 100 penalty minutes, but Schubert was next with 64 and Phillips, Volchenkov and Meszaros were all in the 50s. If you can't beat them in the alley, you can't beat them on the ice. Grizzled veteran Jason Smith was signed to provide, well, fear in the opponent. Smith is one of the NHL's most ferocious competitors when it comes to protecting the area in front of his net. Brian Lee, Ottawa's first-round draft pick, played six games last year and will be groomed to take over Redden's role. He has bulked up considerably since draft day and remains a fluid skater with terrific passing skills. Ottawa native Brendan Bell, who captained the Ottawa 67s, signed as a free agent this summer. Bell was the Canadian Major Junior defenseman of the year in 2003, but Toronto and Phoenix labeled him a minor-league defenseman. This could be a great opportunity for him. Staying healthy has been a problem in recent years. Few teams can boast a more talented first line than Daniel Alfredsson, Dany Heatley and Jason Spezza, but the scoring falls off precipitously after that. Spezza led with 58 assists and 92 points. Heatley led with 41 goals and was third with 82 points. Alfredsson, the captain, had 40 goals and 89 points. Antoine Vermette was fourth-leading scorer with 24 goals and 53 points. Mike Fisher had 23 goals and 47 points. Then came defensemen Redden and Meszaros, followed by third-line center Chris Kelly with 11 goals and 30 points. Chris Neil had 6 goals and 14 assists and was minus-3 with a team-leading 199 penalty minutes. His job seems a little safer with the departure of Brian McGrattan. The Senators need more scoring from the second and third lines and they are top-heavy with defensive centers, actually, all kinds of centers. New coach Craig Hartsburg has talked all summer about character, accountability and a team-first attitude. He may test individuals' commitment right off the bat by breaking up the first line and playing centers at wing. Help could come from any one or more of four top prospects, Ilya Zubov, Alexander Nikulin, Jesse Winchester and Josh Hennessy. It's hard to say what's gone wrong with Hennessy, an excellent junior player who went 43rd in the 2003 draft. He's had three pretty good AHL seasons, but couldn't crack either San Jose or Ottawa's lineup. He has one goal in 15 NHL games and is entering the last year of his contract. Winchester played four solid years at Colgate and came up for one game last year. He was one of the stars of the summer developmental camp, hitting everything that moved and showing a scoring touch. He may need an AHL season, but he intends to have an NHL future. Zubov and Nikulin and well-regarded Russian prospects that played for Binghamton last season in what was basically a learning process. They are both fourth-round draft picks, although Nikulin was rated the fourth-best Russian prospect his age, behind Alexander Ovechkin and Evgeni Malkin. Nikulin had 14 goals and 50 points in 71 Binghamton games while Zubov had 15 goals and 38 points in 74 games there. Occasional scorers Dean McAmmond, Shean Donovan and Kelly may find their jobs threatened as Ottawa looks elsewhere for answers. Fisher isn't a big scorer but his determination and solid defensive work are respected throughout the league. Ruutu was brought in to provide a rougher edge on the checking line. Sophomore Nick Foligno will be asked to add more scoring to his scrappy play. He plays in the mold of his dad and Ottawa could really use that. Cody Bass is similar to Foligno and Ruutu in that he won't score a lot of goals but he's also tough to play against. * The top three forwards, Daniel Alfredsson, Dany Heatley and Jason Spezza, would be welcomed on any NHL team because of theie scoring ability. * Craig Hartsburg won’t allow distractions to get in the way. His favorite topics this summer have been character, accountability and a team-first attitude. * Add veteran Jason Smith, Filip Kuba and Alexandre Picard to holdovers Chris Phillips, Anton Volchenkov and Christoph Schubert and you have the makings of a solid defense.